View our unique engagement rings here. No two people are identical. Everyone has their own quirks, likes, and dislikes. Some people like to set themselves apart by doing everything differently from everyone else. If you’re a recently engaged, self-styled rebel, you may find traditional engagement rings unacceptable. But there’s an alternative. Unique engagement rings allow your creativity and personality to shine. There’s no better way to symbolize your one-of-a-kind relationship than with a unique engagement ring. Where are unique engagements rings sold? You’ll never see unique engagement rings advertised on the television or in the newspaper. That’s because it’s your job to decide which ring is or isn’t unique. What may be unique to someone else may be run-of-the-mill to you. The bad news is that you can’t just walk into any jewelry store and find a case full of unique engagement rings. But that’s also the good news. Now you can shop online for your unique ring. You can rest assured that no one else will have your ring. What are my options for finding unique engagement rings? Choose the stones you want in your ring. It can be a stone inherited from a family member or one you pick yourself. Unique engagement rings aren’t restricted to diamonds. Any precious stone can be used as the main focal point in your unique engagement ring. Pick a ruby, a sapphire, a garnet, or any precious stone that you find beautiful. Decide how you want the stone shaped, how many carats (if it’s a diamond), and the grade. Unique engagement rings give you many options. Our friendly staff is available to help answer any questions you may have. Choose the setting and type of band. Remember, unique engagement rings offer the chance to be creative. Decide if you want the band to be platinum, yellow gold, or white gold. Do you want the stone set inside the band itself, or held in place by prongs? There are numerous options. Those you find by chance – Unique engagement rings don’t have to be brand new. Maybe you want something unique but don’t want to design it yourself. If so, you also have options. Unique engagement rings are about making personal statements. When shopping for your ring, try to find something that represents the bride’s personality. 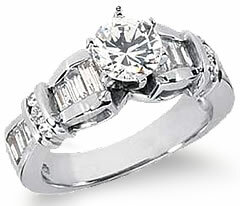 Remember, your engagement ring symbolizes your special relationship.